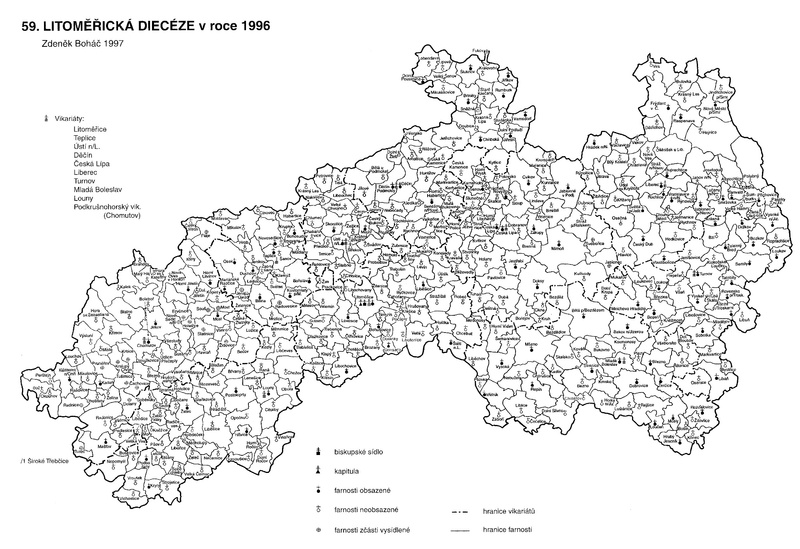 The Litoměřice Regional Archive covers the northern Bohemian region. The website contains parish registers with birth, marriage and death records from the late 16th century to beginning of 20th century for northern Bohemia. It also contains census records and address books, land records, nobility records, school chronicles, charters, maps and photographs. Also available are archival aids and an inventory of entries. Most of the parish records have been posted. The law does not allow births of less than 100 years for marriages and deaths of less than 75 years to be posted. Even if a volume has records older than that timeframe, if it also includes newer records, it will not be posted until it meets the legal requirements. The Litoměřice archive will no longer conduct research for individuals. Any person interested in inspecting archival documents at the archive is required to show proof of identity by showing an identity card or other document of similar validity (e.g. passport); to register each visit in the visitors’ book, and at the beginning of research fill out a research form (badatelsky list). The research form is to be recompleted whenever the subject of inspection or the subject of research are changed, and at the beginning of every calendar year. Researchers can use their own digital cameras, with the consent of the supervisor, to make copies of archival records for personal study needs (without the use of flash). Before visiting, the archive recommends booking a place in the study room, either by telephone or at the archive e-mail address. Visitors can also request documents in advance by email to ensure their availability at the time of the visit. Cadastral Maps: Cadastral Maps are not available through the Litoměřice website. Click here for basic information about accessing cadastral maps. Many records from this archive can also be found in FamilySearch. Additional information about using the Litoměřice Archive can be found at FamilySearch Wiki.